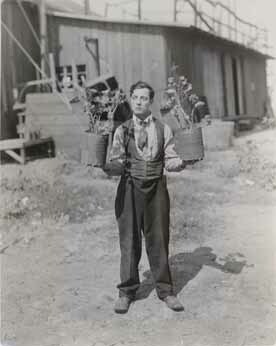 Buster Keaton (1895-1966) was born Joseph Frank Keaton in Piqua, Kansas. Incorporated into the family vaudeville act at a young age, he learned the art of the pratfall and other stunts. The comedian's trademarks included a porkpie hat, baggy pants, oversize shoes, and a deadpan expression. In New York Keaton met Roscoe "Fatty" Arbuckle, and the two appeared together in a number of films between 1917 and 1919, there and in California. After a stint in the Army during World War I, Keaton returned to Hollywood where he went on to star in and direct his own films, including his masterpiece, "The General" (1927). At one time married to actress Natalie Talmadge, he married later Eleanor Norris in 1940. From the 1930s until his death Keaton acted in numerous films in small roles and bit parts, sometimes playing himself, as in "Sunset Blvd." (1950). "A Funny Thing Happened on the Way to the Forum" (1966) was one of his last screen roles. The Academy presented him with a 1959 Honorary Award. The photograph series of the Buster Keaton papers spans from 1909-1966 (bulk 1938-1966) and consists of more than 700 items. The photographs provide a rich representation of Keaton's last three decades, with many personal photographs, candids, and snapshots, as well as material documenting his later film, stage, and television work. There are also some early original vintage photographs from Keaton's infancy, childhood, and vaudeville days and a Keaton family photograph album of snapshots dating from 1909-1917. Photographs from the collection were published in “Buster Keaton Remembered” (2001) by Eleanor Keaton and Jeffrey Vance, with an afterword by Kevin Brownlow. The Buster Keaton papers span the years 1900-1999 (bulk 1924-1958) and encompass 0.4 linear foot. The collection consists of an assortment of material relating to Keaton, including a scenario for "The Navigator" (1924); scripts or sketches for ten unrealized or unconfirmed productions, several written by Keaton; clippings; six date books containing information about vaudeville tours and film releases from 1908 to 1918; an advertising flyer for the Three Keatons; a transcript for a 1958 Columbia University oral history with Keaton; and a scrapbook with clippings from 1900 to 1909 regarding vaudeville and an advertisement for "The Scarecrow" (1920). Of interest are a pair of Keaton's baby shoes, which, according to his wife, Eleanor, were given to Keaton's mother, Myra, in 1895 by a Kickapoo woman in thanks for nursing the woman's infant. Gift of Eleanor Keaton, 1998-2001, with additions from Kevin Brownlow, 2000, and Jeffrey Vance, 2001.